I’ve spent a lot of time over the past four years, unsuccessfully, trying to figure out what Doug and Enzo’s priorities are. As we’ve seen clearly recently, our city’s parks do not make the cut, nor does the safety of school children. We also know that the general appearance of the city is considered secondary. Now we have stark evidence that the safety of the community does not rise to the level of actionable importance to them either. We know this because a local business has been parking their 9000 gallon gasoline tanker in a residential neighborhood for nearly five months, and not only have Doug and Enzo taken no action to stop the practice, they have actively intervened, on multiple occasions, to stop the Warren Fire Department from enforcing the Ohio Fire Codes. We know this for fact because we have received more than 20 documents from the WFD including “Fire Safety Inspection” reports, “Violation Notices” and file notes related to the offices of Valley View Petroleum located at 1860 Elm Road in Warren. These reports show that on April 12, 2015 Capt. William Smith of the WFD wrote in his inspection report of that day that parking the gasoline tanker violated multiple Ohio Fire Codes. Capt. Smith further informed an employee at that location that the owner should contact him a.s.a.p., and the tanker should be moved that day. The owner did not call Capt. Smith, but he did call Mayor Franklin, who called Capt. Smith, which was the first step in a lengthy process in which Capt. Smith was eventually told by Director of Public Safety and Service, Enzo Cantalamessa, to wait until he and Mayor Franklin could meet with the owner and negotiate a settlement. At the end of this post is a chronological summary of the citations and notes covering the situation. What it shows is that Doug and Enzo repeatedly either intervened to slow the WFD from taking legal action to correct a dangerous situation, or failed to do anything to correct it themselves. If you think I’m being hyperbolic about the danger level of this situation, Google map 1860 Elm Road and see for yourself how close the rear parking lot is to the homes on Tiffany and Nocturne, and then watch this video. A secondary issue that I will deal with in a separate post, relates to the manner in which the city responded to my public records request. Their first response was very clearly a failure; many documents were left out and at least one was redacted without noting that fact. I believe the only reason they finally responded in full was that they knew that Captain Smith of the Warren Fire Department supplied me with a full set of documents despite attempts by the administration to stop him. Capt. Smith ignored what he believed was an illegal order to withhold public information. Everyone in the city of Warren owes Capt. Smith a huge debt of gratitude for having the courage to stand up and insist that public safety takes precedence over politics, and to obey the Sunshine laws; to have done otherwise would have put the city in additional legal jeopardy. Read the timeline below and draw your own conclusion about who was served here. You can also download a PDF of the document: WFD report rcvd Aug31. (They are not in date order. This is how I received them.) I have added a few notes regarding my own involvement to abstracts I created from the file notes. April 12: First inspection report indicating the tanker could not be parked there. 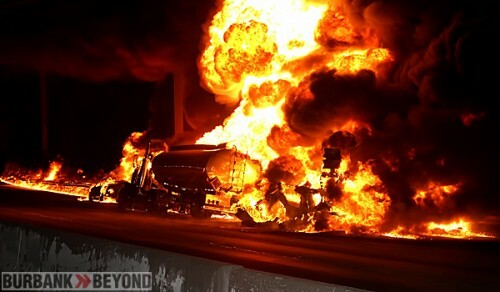 Captain Smith told an employee the truck should be moved that day. He asked the business owner to call him; he did not, but Mayor Franklin called Capt. Smith later that day to inquire about the circumstances. April 20: Dennis Blank hears Howland Police Chief Monroe talk at NENA about the VV tankers parked now in Warren. April 27: Two fuel tankers still on site. Capt. Smith meets with Attorney Lake. They decide to issue citations carrying $1000 fine per occurrence. Director Cantalamessa asks them to wait, saying he will schedule a meeting with the business owner, Abe Isaac and Mayor Franklin to resolve the issue through negotiation. Cantalamessa says he will keep the WFD informed. April 30: Capt. Smith sees two tankers on site again. Is finally able to talk to owner Isaac. Smith stresses the urgency of moving the trucks immediately. Smith confers again with Cantalamessa who again asked him not to issue a citation or fine pending the outcome of a meeting with Isaac and Mayor Franklin. May 6: Capt. Smith speaks with owner Isaac who tells him he met with Doug and Enzo and a solution is “forthcoming.” Smith contacts Enzo who says a solution is near. May 12: The tankers are still there. Smith calls Enzo who promises to speak to Isaac and call Smith back. He does not call back by the end of the day as promised. Smith sees tanker unloading fuel that evening and gives the driver his card, asking him to have the owner call him; he does not. May 13: Capt. Smith speaks to Attorney Lake of the Warren Law Department again, who tells Smith he has spoken to Enzo who has asked him not to issue, or allow the WFD to issue, a citation of any kind to Isaac pending City Hall’s negotiations with him. There is no timeline for reaching compliance. May 15: Capt. Smith calls Cantalamessa and leaves a message with his secretary. Enzo does not call back. Smith emails Enzo with a suggested location on city owned property where the tankers could be parked safely until a permanent location is found. Smith does not receive a response. May 30: The tankers are both at the 1860 Elm Road location as they were on May 27th. June 2: One tanker seen at the premises that morning. June 5: Two tankers were on site. Capt. Smith speaks to Mayor Franklin at the African American Festival that afternoon and reminds him that this continues to be a serious situation. Franklin promises to call Isaac that day and tell him to stop parking there. June 11: Two tankers still on site that morning. If the Mayor called Isaac it didn’t work. June 17: One tanker there, unattended and unsecured. June 29: One tanker there, unattended and unsecured. July 2: Two tankers there, unattended and unsecured. July 8: Two tankers there, unattended and unsecured. July 14: Two tankers there, unattended and unsecured. July 20: One tanker there, unattended and unsecured. July 23: Two tankers there, unattended and unsecured. July 29: Two tankers there, unattended and unsecured. Capt. Smith speaks with WFD Chief Nussle about the situation; Nussle advises Smith to exercise patience. August 7: One tanker there, unattended and unsecured. Capt. Smith again speaks with WFD Chief Nussle about the situation; Nussle, again, advises Smith to exercise patience. August 10: Another citation issued. August 13: Another citation issued. August 23: While out election canvassing, Blank learns from residents on Tiffany Dr that tankers are still parked there regularly. Aug 24: Dennis Blank makes a verbal request for copies of all citations issued to Valley View to Chief Nussle of WFD. The Chief says he will have to check with Enzo Cantalamessa. August 25: Another citation issued. August 26: Blank goes to WFD and speaks to Nussle who tells him Cantalamessa has told him that the request is being reviewed by the Warren Law Department. Blank sees Law Director Hicks later that day and asks for a status on the request. Hicks tells Blank there are no documents such as those requested. Blank then writes and hand delivers a formal written request to WFD. August 28: Blank receives only four of the more than 20 documents in the Valley View file. Blank then writes and delivers a second, broader document request to the WFD. August 31: Another citation issued. Blank calls Cantalamessa/Franklin office at 2:00 pm asking if more documents are coming. Secretary Hathhorn says she does not know but will find out and call him back. She does not call back. Blank calls Capt. Smith late that afternoon and tells him he received only 4 documents in response to his document request. Capt. Smith tells Blank there are “many more” and invites him to the WFD office where he provides copies of the complete file. Ms. Hathhorn emails a new set of documents which arrive at 8:00 pm. Posted Tuesday, September 1st, 2015 under Crime, Vision.